Initiate Search by clicking/tapping the magnifying glass icon. The Library subscribes to multiple digital collection providers (e.g. Overdrive, Hoopla, Kanopy etc.). The Provider's name is noted below each catalog item (see below). Note the provider for Step 3. We recommend that new eBook and eMedia users go straight to the Provider's app for the simplest eLibrary experience. Install the Provider's App on your phone or tablet. 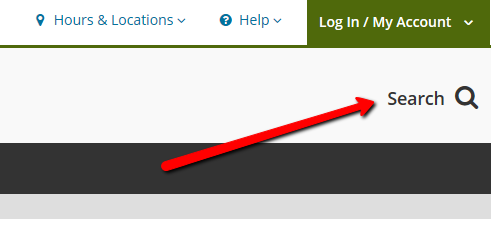 Set up an account (often using your Library Card # and PIN). Visit our Online Resources FAQs for information on available apps. The check out process varies by app, but usually involves a simple click. Some apps require you to download the files to your device. View our Tutorials for eBooks & eMedia to get started with individual apps.